A high-specification opacity and dust monitor meeting global compliance standards for monitoring combustion processes. 4500 MkIII is the most accurate and reliable continuous opacity monitor available, combining AMETEK Land’s ground-breaking innovation and simple design for precise, problem-free operation. Unmatched, class-leading accuracy ensures compliance limits for dust emissions and stack opacity are met with confidence. This avoids the risk of regulator fines while lowering costs through operational efficiencies. 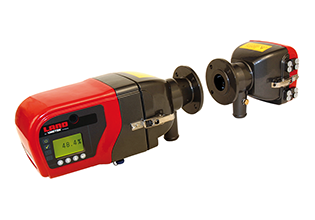 The 4500 MkIII employs a highly homogenous LED light source to minimize sensitivity to optical misalignment. The multi-prism retro-reflector reduces thermal drift for the lowest possible detection limit. Together with a flood LED to minimize electronic drift, these patented technologies provide you highly stable, highly accurate results. Fitting stack diameters of 0.3m-15m (1 ft-50ft), 4500 MkIII is suitable for the continuous monitoring of dust and opacity in boilers, heaters, furnaces and other combustion applications in the power generation, hydrocarbon processing, industrial boilers, and steel industries. The 4500 MkIII achieves the highest possible specification for the fundamental performance parameters for a compliance opacity monitor, as defined by the internationally-recognised ASTM D6216 Standard. Its performance has been independently verified, meeting QAL 1 requirements according to EN 15267-3. The built-in menu display is intuitive and simple to use, with simultaneous text and icon prompts. There’s no need to take a laptop or handheld terminal to the installation location, making setup and operation hassle-free. 4500 MkIII has all the compatible accessories you need to tailor it to your process. Options include a control room unit, auxiliary functions unit, fail-safe shutters and calibration accessories, as well as a range of mountings and adaptors for existing fittings.